As we previously reported, conditions for civil society's independent operation have been increasingly restricted in Kenya over recent months. In this update, we provide evidence the Kenyan authorities' continuing crackdown on critical civic groups as the country moves closer to elections in August 2017. On 20th December, a week after President Uhuru Kenyatta claimed foreign nations were using civil society to influence the outcome of the elections, Kenya's NGO board ordered the International Foundation for Election Systems (IFES) to suspend its election-related activities, saying the organisation was not duly registered. IFES programs included civic education, voter education, and early conflict warning. In a further illustration of the clampdown, on 6th January, the Kenya Human Rights Commission (KHRC) was sent an email from the Kenyan authorities, in which they threatened to conduct an inquiry into serious financial and management impropriety. An internal government memorandum later outlined the recommended steps to be taken; these included, freezing KHRC's bank accounts, starting a criminal investigation and advising the Kenyan Revenue Authority to begin measures to recover the taxes that KHRC allegedly owes the government. While this is not the first time KHRC has been targetted by the Kenyan authorities, this incident is evidence that authorities are becoming increasingly emboldened in their smear campaigns against human rightst groups. 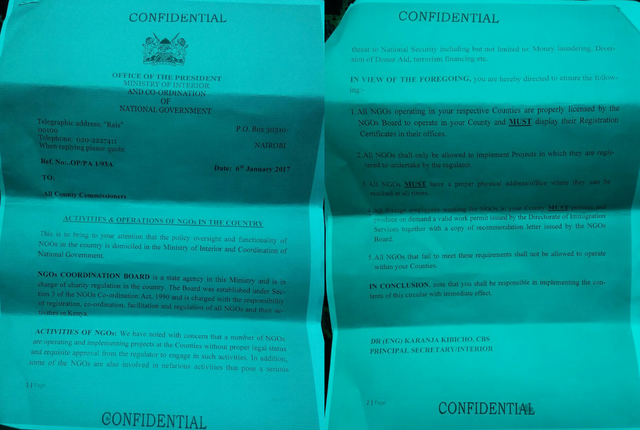 In a separate incident, on 23rd January, Kenyan security forces detained two prominent critics of South Sudan's government. Prominent South Sundanese human rights lawyer Dong Samuel Luak was arrested and, allegedly held without access to legal counsel while being subject to a deportation order. The next day, police also detained Aggrey Idri, chairperson of the Sudan People’s Liberation Movement-in-Opposition’s (SPLM-O) Humanitarian Affairs committee. On 27th January, Kenya's high court granted an order barring the deportation of the two men without due process. Despite the order, Dong and Idri's location is currently unknown. Many fear that they may have been abducted brought to South Sudan. The Court had been considering charges brought against two petitioners for allegedly publishing defamatory statements on their social media account. Civil society has welcomed the court ruling as a victory for freedom of speech in Kenya.